Wicked Local article! Full page!!! 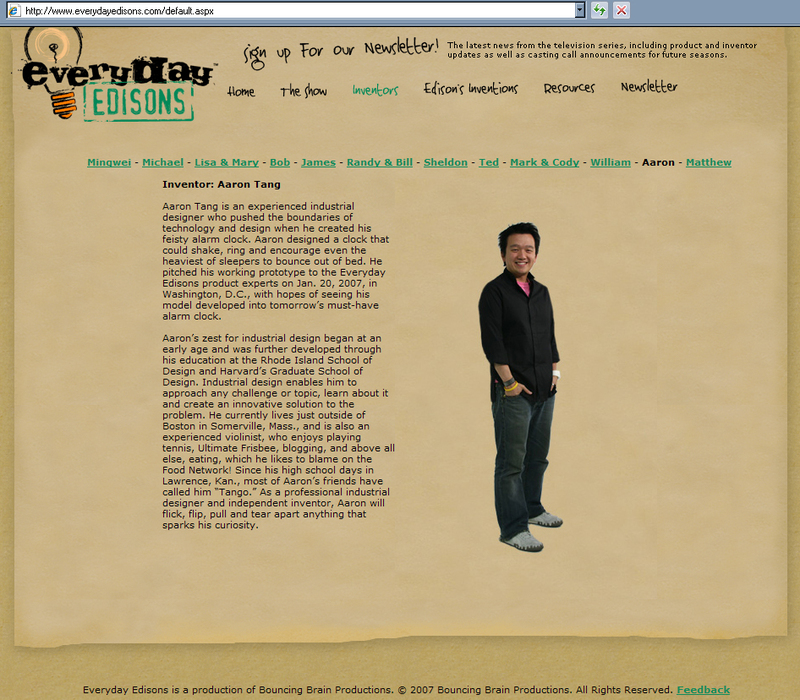 Some screen shots from the live homepage of Everyday Edisons! The show where Aaron and his alarm clock are introduced on Everyday Edisons. This entry was posted on Thursday, June 19th, 2008 at 4:54 am	and is filed under art, brand, design, entertainment, experience, fun, ideas, information, inspiration, me, style, tech, wacky. You can follow any responses to this entry through the RSS 2.0 feed. You can leave a response, or trackback from your own site. Congratulations Aaron! We’ve had a great time working with you and your product on the show. 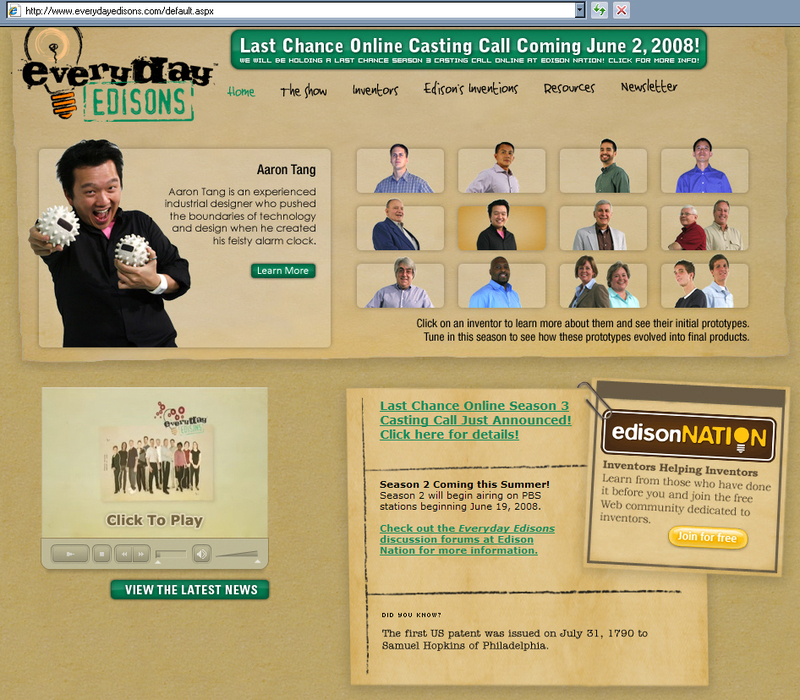 Have you set up your account on Edison Nation yet? Check it out at http://www.edisonnation.com. 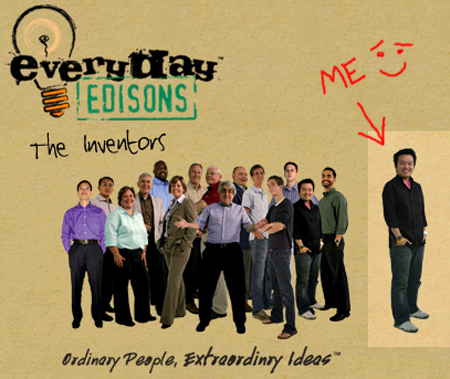 Many of the other inventors from Everyday Edisons also have profiles up there – and a lot of people are talking about the show and inventions in the forums. Too bad there wasnt a premiere party this year…would have been nice to see ya’ll again..maybe soon though yeah ! phil…man, i wih i knew how. I’m not even sure how to get it over in boston yet…it’s broadcasting on the HD PBS which I do not have! buggers, my own show and I cant watch it! hahha… come on over anytime! congratulations lil’ brother!!!! i’m so proud of you! oh my GAWD! Dude that’s GREAT! I still drool over your Popsicle lamp! You were always the smartest and and most fun ID person in school! I’m totally gonna have to check this out now. Way to go. Looks like you’re having fun. How exciting! Wish i could see it here in the UK but will watch out for YouTube clips. Congratulations! Very nice, you deserve to be on a better quality show then that other show we were on together. I’ll be watching for sure. awesome!!!!!! i remember you telling me that thing went off in your black bag in the subway.. and people were givin you weird looks…ahhahahaha.. i want one too! CONGRATS AARON! We had a blast on the set of the “OTHER” show, but I am SO PROUD of you to have made it to the TOP with EE. I can’t wait to watch you do you thing! You are one TALENTED GUY! 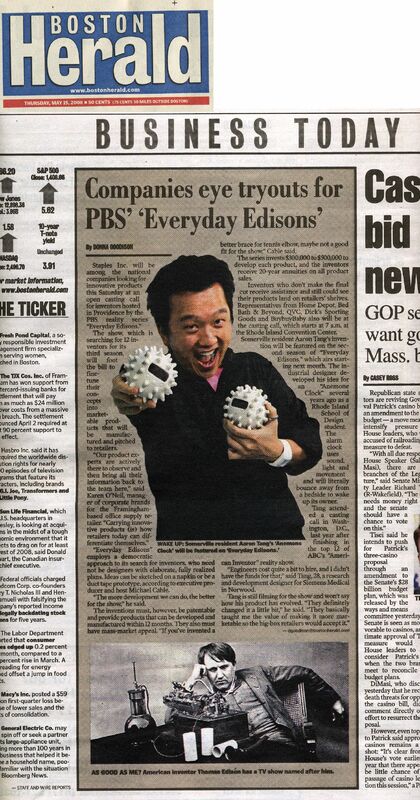 The “OTHER SHOW” did help me bring my product to market, and with over 20 million viewers, and the show being aired in 21 other countries, gave us the exposure to take HEADLINE IT! to an international status. DREAMS DO COME TRUE.. I am living proof of that with my HEALDINE IT! product, and I hope that you follow with much success. Congratulations on this! I will definitely be watching closely, if not from the sidelines. It’s been a while since we last spoke. Hope all is well. Hiya. I’ve been a fan of your blog for about a year, taking regular inspiration from posts about independent inventors, designers and such. This bit takes the cake though. Congratulations. Also, I’ve got a question that I was hoping you might be able to help me find the answer to. I’ve been working on an idea for an open source product/company for several years, and I’d like to make it a reality, but I wantto protect myself with some kind of patent. Unfortunately, I know nothing about patent law. It complicates the matter that the “product” is more of a business model relating to an array of products than a single “thing”. Is such a thing even patentable? I also don’t know how careful I have to be talking about it because I’ve had ideas stolen from me before because I spoke too freely about them. Even if you could just point me somewhere else, that’d be great. Congratulations, Tango!!! This is awesome! I checked and it seems to not be airing in SF! 🙁 Hope all is well! sweeeettt amigo mio!!! cant wait to hang out soon!! your room is fantastic!! 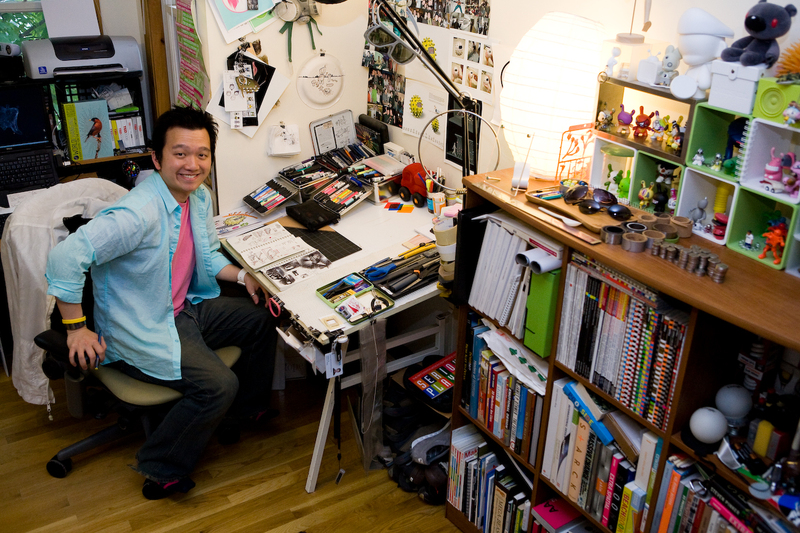 ha ha ha.. i like all the toys by your desk! Great job on the invention! cant wait to hang saturday!!! He he, great to see this Tango, keep up the good work! One day IÂ´ll have to get a copy of this alarm clock! All the best from Iceland! That is so great! So excited for you! i finally got to watch the show. Now I can’t wait to go and buy one. I found out about this alarm clock about a year ago and I am a huge fan! I am sure you get tons of people asking this, but when can I get one????????????? I know, it takes time, but would this be the place to find out when they go on sale?